Faculty members, postdoctoral scholars, and graduate students of the Andrew and Peggy Cherng Department of Medical Engineering at Caltech (MedE) apply engineering principles in the health sphere. Our goal is to design and fabricate devices and systems for translational medicine—including diagnostics, therapeutics, implants, and non-invasive imaging—that will lead to cheaper, more effective, and more accessible health care. In light of the increasing complexity and prevalence of devices and systems engineering in medicine, the department brings together experts in the fields of aerospace engineering, applied physics, biological engineering, computer science, electrical engineering, materials science, and mechanical engineering. Many investigators in the Cherng Department of Medical Engineering also work closely with researchers from the biological and chemical engineering programs in Caltech’s divisions of Biology and Biological Engineering (BBE) and Chemistry and Chemical Engineering (CCE). In addition, to advance translational medical research that best meets clinicians’ and patients’ most pressing needs, scientists and engineers in the Cherng Department of Medical Engineering work with researchers from the Keck School of Medicine of USC, the Geffen School of Medicine at UCLA, City of Hope, the UCSF School of Medicine, Huntington Memorial Hospital, and Huntington Memorial Research Institutes. The Cherng Department of Medical Engineering offers the degrees of doctor of philosophy and master of science, with an emphasis on PhD-level study and research. We are confident that our well-established, highly resourceful research environment will effectively nurture the leaders of tomorrow in this important field. For more information, please contact the department’s executive officer and holder of the Andrew and Peggy Cherng Medical Engineering Leadership Chair, Professor Yu-Chong Tai, or any of the medical engineering faculty members listed on the “People” section of this website. 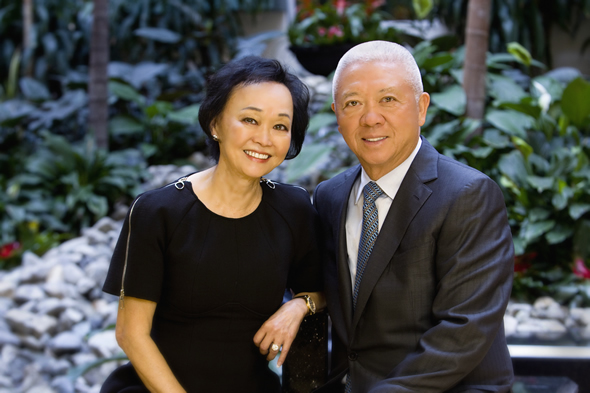 Andrew and Peggy Cherng’s transformational $30 million gift to endow Caltech’s medical engineering program is congruent with the couple’s belief in “paying it forward” to improve the quality of life for people in their community and around the globe. As co-chairs and co-CEOs of Panda Restaurant Group—which operates some 2,000 Panda Express restaurants across the country and around the world—the Cherngs take corporate responsibility very seriously. Read more about the Cherngs’ gift and the impact of Break Through: The Caltech Campaign, a fundraising effort that aims to raise $2 billion to secure Caltech’s future as a source of transformative discovery for the world.